The third quarter's good news had already been priced into the stock, with room to spare for a quick correction. 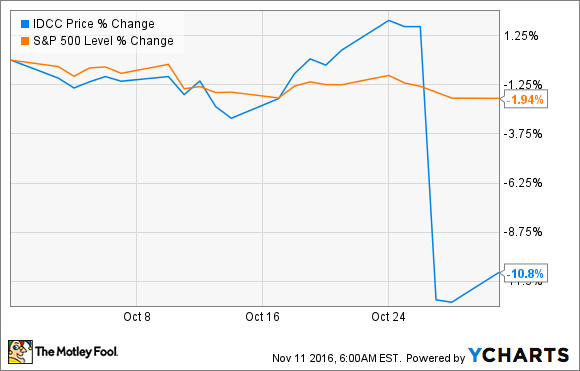 Shares of InterDigital (NASDAQ:IDCC) fell 10.8% in October, according to data from S&P Global Market Intelligence. The researcher and licencor of wireless communication technologies reported third-quarter results near the end of the month, and they were on the low end of management's own expectations. InterDigital shares closed 14% lower the next day. In the third quarter, InterDigital closed a technology license deal with Chinese consumer electronics giant Huawei. With that agreement in mind, management expected to see total revenue land somewhere between $200 million and $225 million. InterDigital's total revenue stopped at $208 million in the final tally, well below the midpoint of the updated guidance. Recurring sales increased by a modest 7% year over year while the Huawei windfall showed up mostly in the form of dramatically higher one-time license fees for past patent royalties. Both the top and bottom lines also fell just below Wall Street's projections. Management did not issue any guidance for the fourth quarter, because InterDigital needs fresh order reports from its per-unit royalty licensees first. If a 14% overnight drop feels like a harsh punishment for barely missing the midpoint of management's guidance targets, keep in mind that InterDigital has been flying high in 2016. Even after October's plunge, the stock is still up by a market-stomping 52% year to date. Moreover, the non-recurring nature of the Huawei payment makes it a welcome windfall that doesn't do much for InterDigital's ongoing operations. Investors have already priced in the Huawei deal in the company's share prices, and several analyst firms recently lowered their InterDigital ratings to a hold because an oft-touted focus on technologies for the Internet of Things isn't getting any traction.